I’ve been shopping more and more on Amazon Fashion and lately I’ve been intrigued by the large selection of sweaters. When I typed in ‘sweaters’ in the search bar, there were so many affordable options. Winter season is sweater weather and I can’t get enough of them, especially in Chicago. So if they’re affordable, why not try some out? 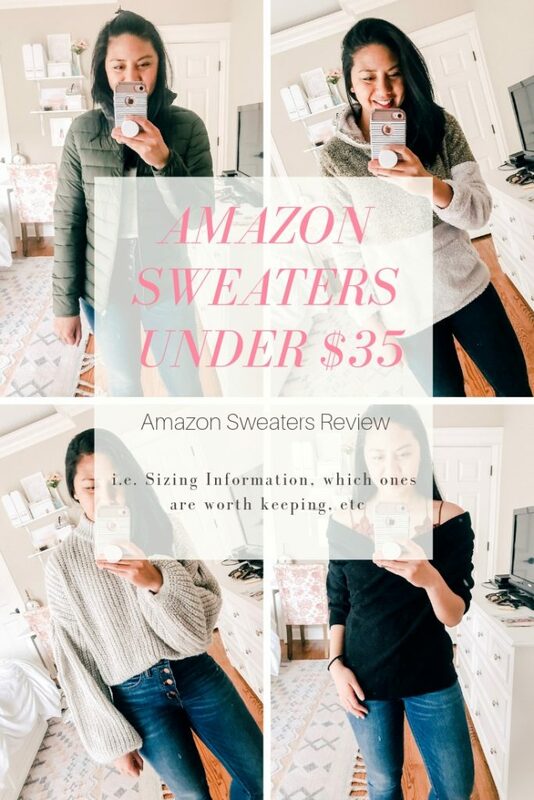 I asked in my Instagram Stories if you all would be interested if I shared a review of some of the Amazon sweaters I purchased, and it was unanimously yes. 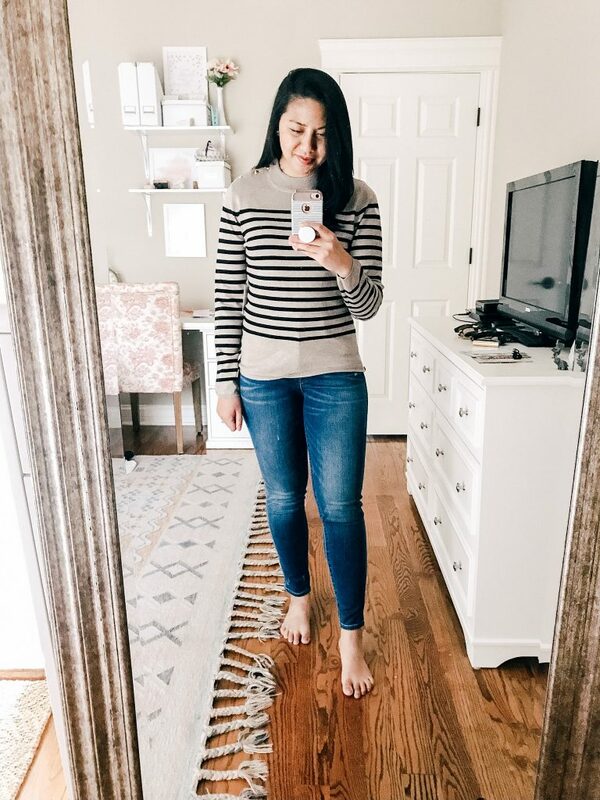 So today’s post is all about my sweaters and sharing my thoughts on the quality, sizing, and if I decided to keep them. I tried to keep my selections under $35. The whole point of this is to find out if I can find a good and affordable sweater. Before we begin, I want to give you all my size. That way you have a better idea as to how I am doing my comparison and help you make a decision if this is a sweater you want to purchase. My height is 5’4″ and I weigh 140 pounds. My bust is 32C. I normally wear a size S/size 4. For bottoms, I wear a size small/size 27/size 4. There are 2 pairs of jeans that I wore during this try-on session. I wore these jeggings. They are amazing and I’ve had them for a couple years already. They fit true to size. I am also wearing my all time favorite button fly jeans. SIZING: This sweater has ‘one size’. When I received it, I was actually pleased with the size. The sweater has an oversized fit to it without looking dumpy. There is definitely enough room for someone who wears size large. I just think the sweater will look different. For me, it has a more loose, boxier fit. REVIEW: I really like the balloon sleeves. 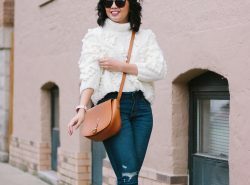 This is more of a cropped sweater, yet a front tuck is do-able. So I like that! I am impressed that for a one size fits all sweater, that it can actually fit several different sizes. The sweater has a loose knit, which means you may need to layer underneath to stay warm. 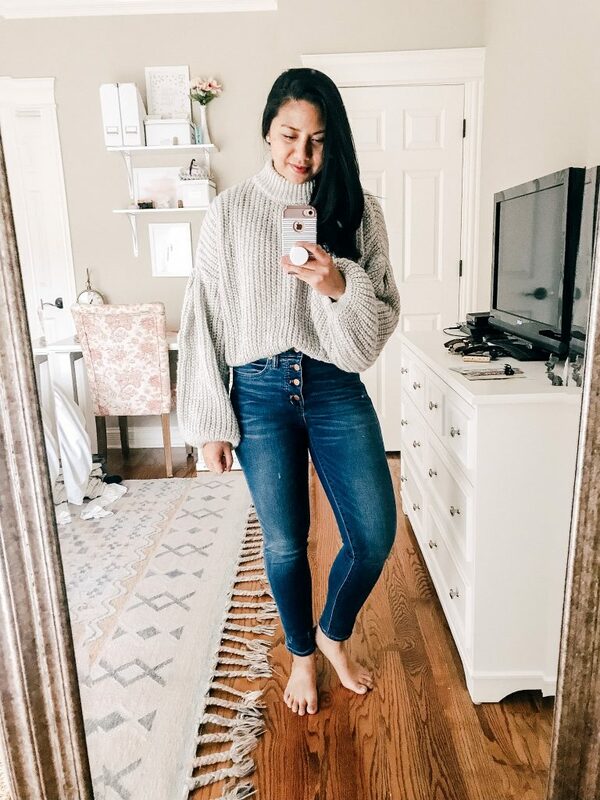 It’s a cozy sweater but the loose knit style allows cold air to easily come in. VERDICT: I am keeping it. 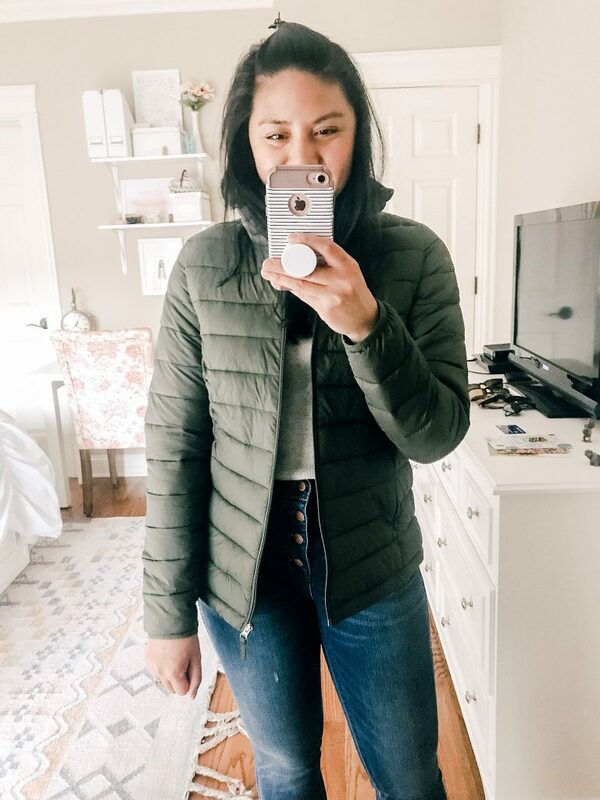 I love that it is cozy and I don’t mind layering underneath on extremely cold days. Plus, the style of the sweater is so chic. SIZING: Fits true to size. I got a size small. REVIEW: I like the fit. It’s fitted but not snug. So if you want to wear a long-sleeve or t-shirt underneath, you totally can without feeling restricted. On extremely cold days, I would probably layer it with a heattech long-sleeve. The pullover is soft and cozy. VERDICT: I am keeping it. 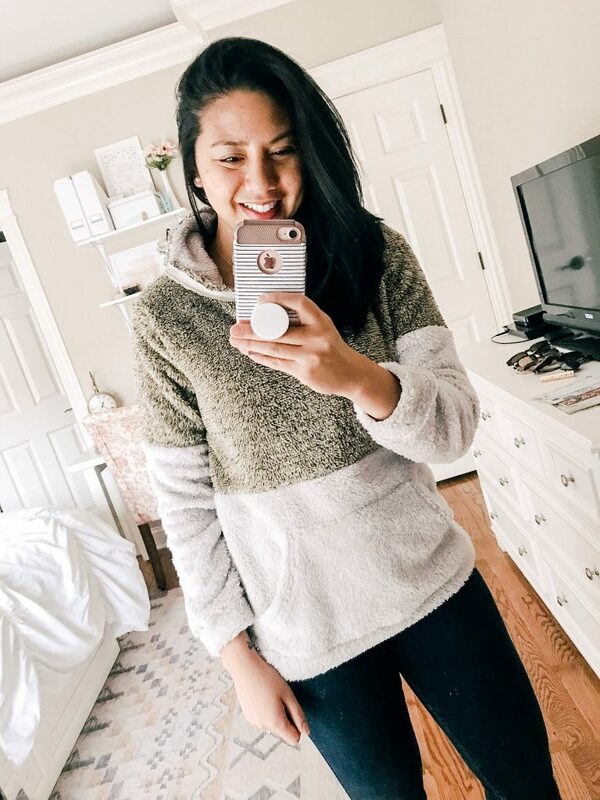 Fleece pullovers are all the rage, and I like that it is half the cost compared to other retailers. SIZING: Fits true to size. I got a size small. Sleeves are slightly shorter than usual. REVIEW: The sweater is not tunic style at all. If I wanted it to be more tunic length, I would have to size up. How the sweater is constructed is odd. Where the armpit would be looks off when you wear it off the shoulder. So I was disappointed. I’ve owned a few off the shoulder sweaters, and they just don’t fit this way. However, this sweater has a lot of great reviews. So I’m probably just very picky. VERDICT: Returning it. 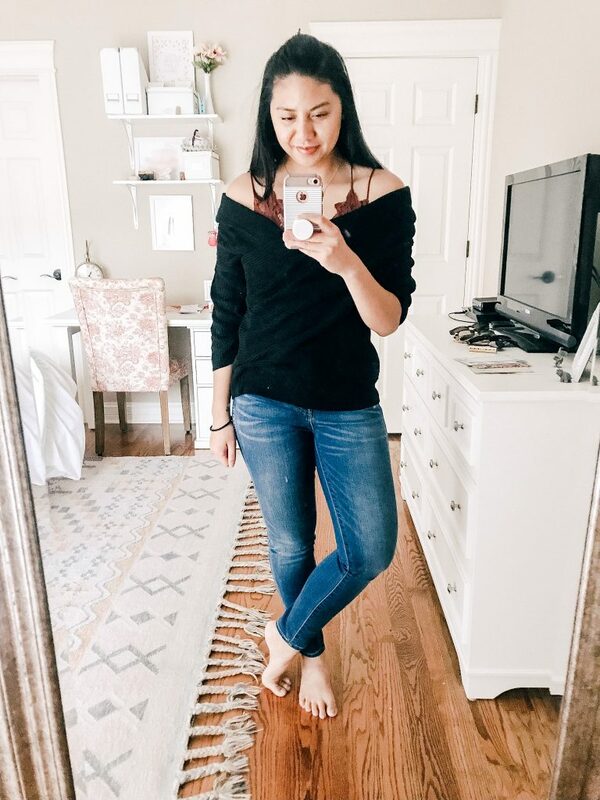 Even though it is affordable, I think I can find a better off the shoulder sweater at around the same price. SIZING: I think it fits true to size. All the reviews say the sizing is small, and they recommend sizing up. Therefore, I got a size M. The medium fits fine, but I think a small would have fit well too. With that said, I will still keep the medium in case this sweater shrinks after being washed. 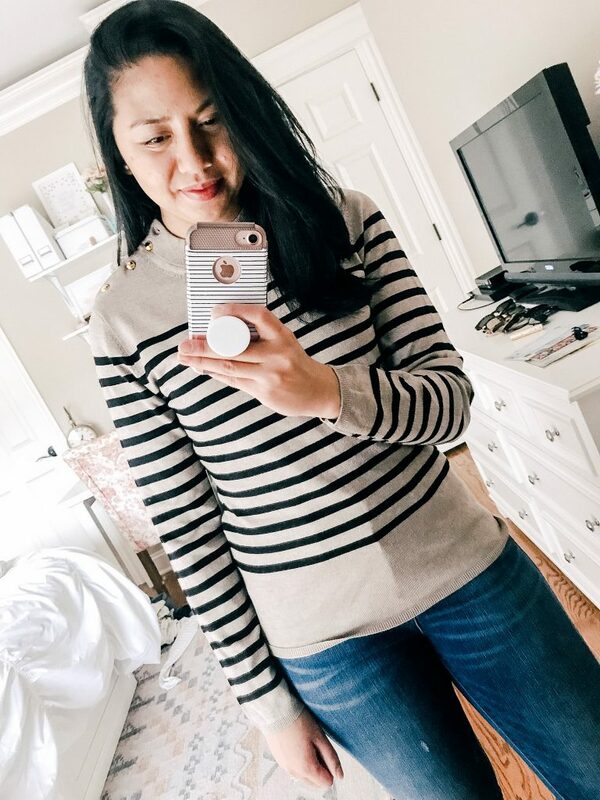 REVIEW: This is a fitted sweater, and it’s not too thick (not thin either). The material is similar to a cotton/poly blend sweater. 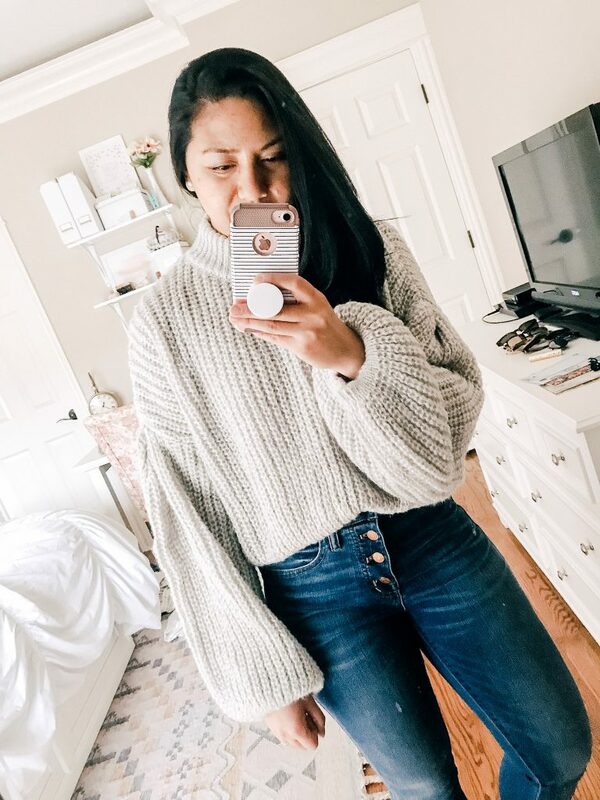 I love the neutral colors of this sweater and I think this one has a nice classic look. The gold button detail is so chic! I wish they had a more boxier style because then this sweater would be a favorite for sure! VERDICT: I am keeping it. It has a classic style which I think will be very versatile. SIZING: Fits true to size. I got a small. 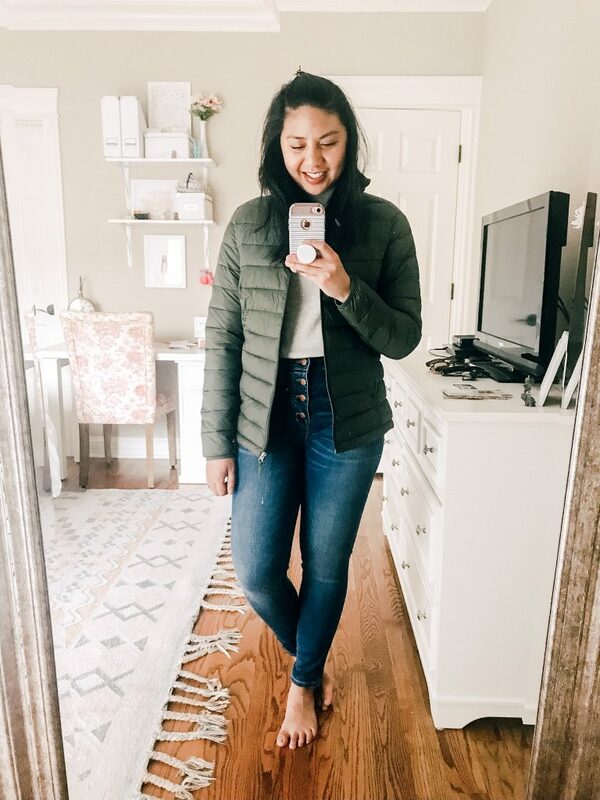 REVIEW: I love this puffer jacket! I am very impressed with it considering how affordable it is. My favorite feature is that it is packable. 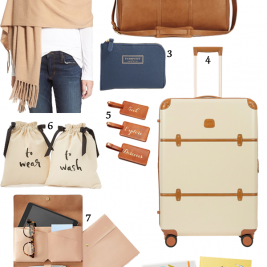 You can roll it up into a small ball and it can pretty much fit in any space or bag. It comes with a tiny bag to place your jacket in. There’s definitely room to wear a sweater underneath, it is warm, and comfortable. VERDICT: For sure keeping it. 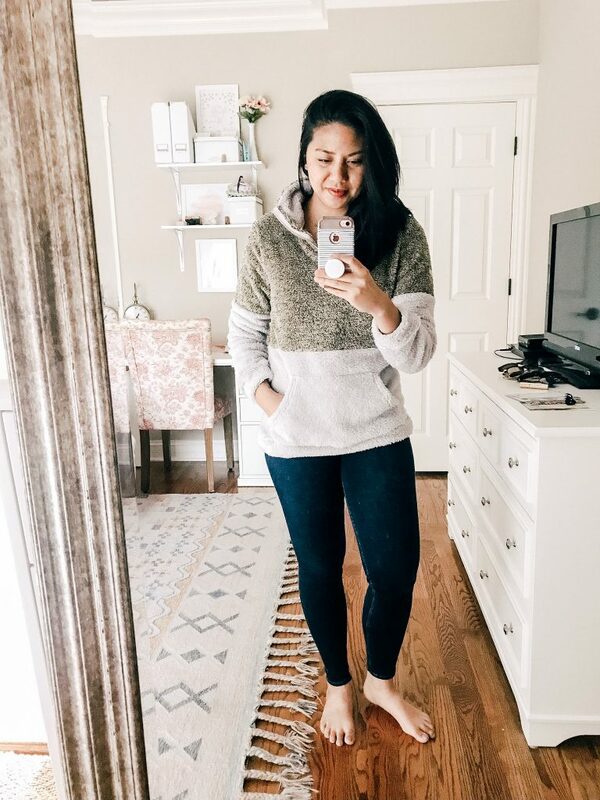 REVIEW: The crossover style is what makes this sweater so cute. It fits slightly loose and the yellow color is fun. I actually wore this sweater in the Fall with a polka dot skirt. The sleeve length is a tad short, but I personally don’t find it a problem. I also love to scrunch up my sleeves. VERDICT: I obviously kept it. See how I styled it here, and you can have a better idea of the sleeve length too. SIZING: Similar to the loose knit sweater, it is a ‘One Size’ fit. I honestly think it can fit someone up to a size medium. REVIEW: It is a chic sweater, but it is chunkier than I expected. 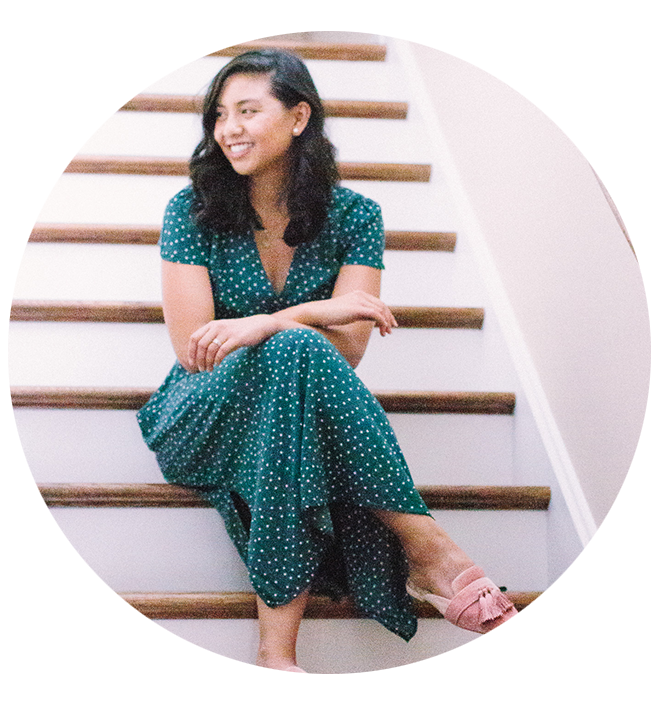 Originally, I wanted to style this sweater with a midi skirt, but unfortunately it was too chunky to tuck in. As much as I love the off the shoulder style, it doesn’t stay put at all. 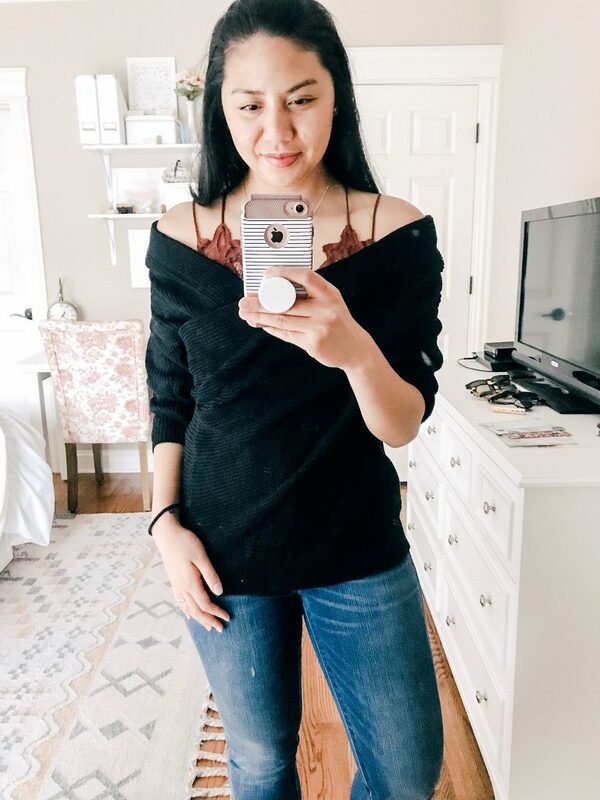 I recommend wearing a flattering lace bralette so that when it falls off more than it should, you still look put together. There are a few things I want you all to know when I was in the process of purchasing these Amazon sweaters. What I thought would be an easy online shopping experience ended up being a much longer process. Below are the reasons why. I think the appeal of these is the price and the Prime shipping. However, I noticed that the Prime shipping is not always available. For instance, today may have Prime Shipping, but tomorrow the Prime shipping may no longer be available, etc. Another thing is that the Prime shipping may only be available for a specific color or size. So that part was frustrating. Overall, you won’t know about the Prime shipping (even though it shows up as a Prime item in the search result), until you click on the item’s page. If you read the fine print of some of these, without prime shipping, the shipping can take a few weeks. I’ve noticed that there are a lot of retailers that use the same picture/image. But if you read more about them and look at some of the customer’s images, the quality/style/fit is different. So I think some of these retailers are deceitful. I had to look at several retailers with the same image and figure out which one had the exact item I was looking for. I know I mentioned several times that the price is affordable. However, spending $30 on some of these Amazon sweaters may not be worth it if you consider the quality. You can find an amazing $30 sweater elsewhere at more reputable retailers. But the appeal to this if you find one that is Prime, you can quickly receive it. Overall, I will continue shopping for clothes on Amazon. As for sweaters, I was more surprised that it was quite the process. It could possibly be because I am very picky when it comes to sweaters. I think a good quality sweater really makes a difference even if it is something basic. So basically Amazon is THE best!! Love all of your picks!! Haha Amazon is pretty awesome! I love the pullover knit. So chic. 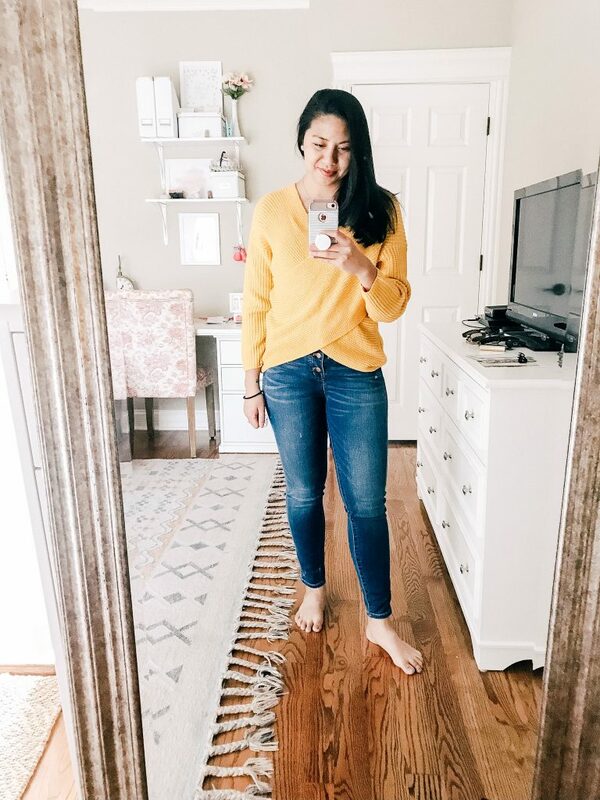 Beautiful Selections; the grey cable knit off the shoulder sweater and the yellow cross over sweater are so, so gorgeous. Happy Friday. These sweaters looks so beautiful! My favorite is first one! Thank you for the tips, very useful information! Thank you so much! 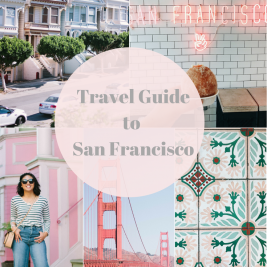 Hope you find it helpful! Comfy sweaters are the best! I love the sweaters! Definitely sweater weather here in Texas! Hopefully it is not too cold in Texas! Love Amazon and all of the variety!! All the sweaters you picked out are so cute!! Loving the two toned one! I always enjoy reading review type posts, so helpful! I love me some Amazon, but have never ordered clothes before. I’m with you and I find review post so helpful. Glad you enjoyed this one! These are all so cute! I rarely have luck with clothes on Amazon. I’ve also gotten really picky and don’t want to buy anything with polyester and I swear everything on there has polyester in it!! Haha, they do have a large amount of poly! You look pretty, love them all. I definitely tried to find more affordable options! I love the grey sweater with the cool loose sleeves the most. Looks amazing on! Is it the balloon sleeves? I love that one too! After this post I need to buy clothes in amazon for the first time. Love all of them. I hope my post was helpful! I’ve never thought about buying clothes from amazon, but you’re convincing mw now! Hahah yes! There are some gems! 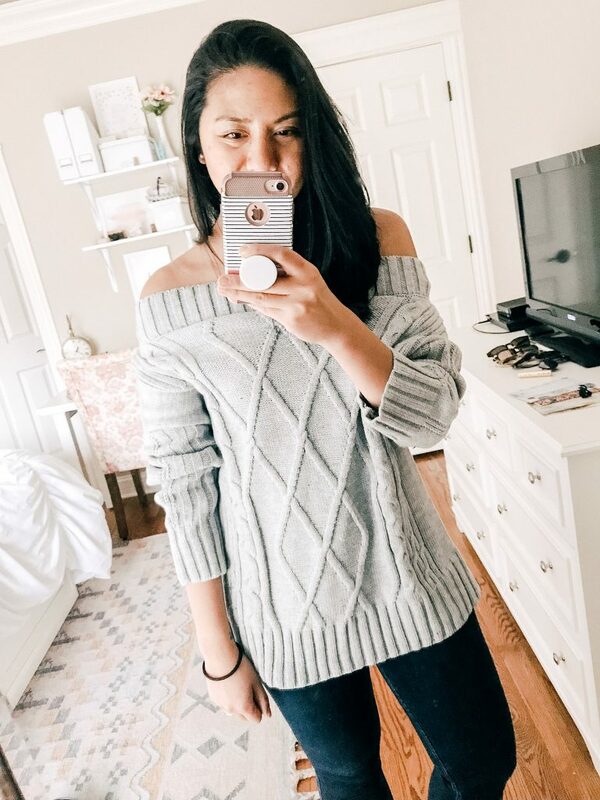 Honestly never even thought to check out sweaters on Amazon, and you have so many cute finds! I love the grey statement sleeve one. Been doing this recently. There are some good ones! Such a great article! I loved your review of each piece and the in-depth, overall review of purchasing on Amazon. 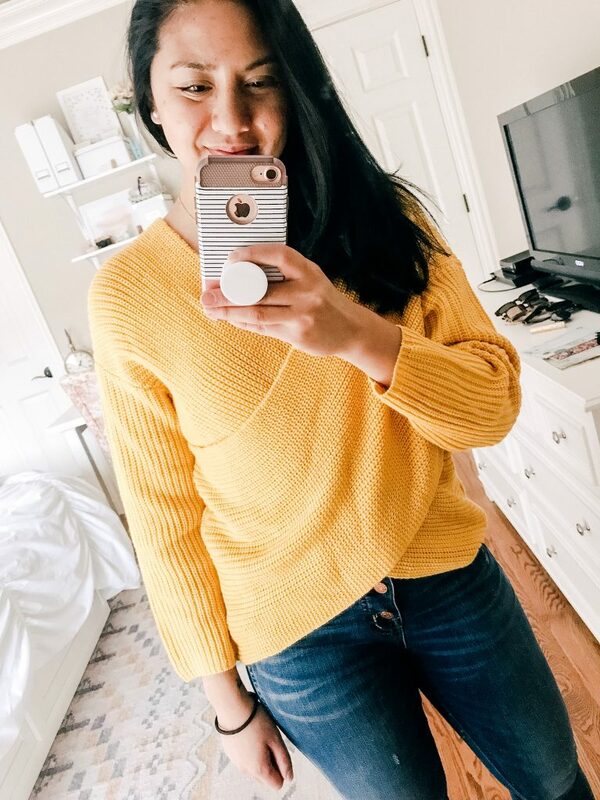 That yellow wrap sweater is so lovely, and the striped one is also super cute! So many great sweaters here! Amazon has been killing it lately with the fashion game. I’ve never been a huge fan of pieces that are ‘one size’ but if it’s amazon with free shipping and returns, it can’t hurt to try. 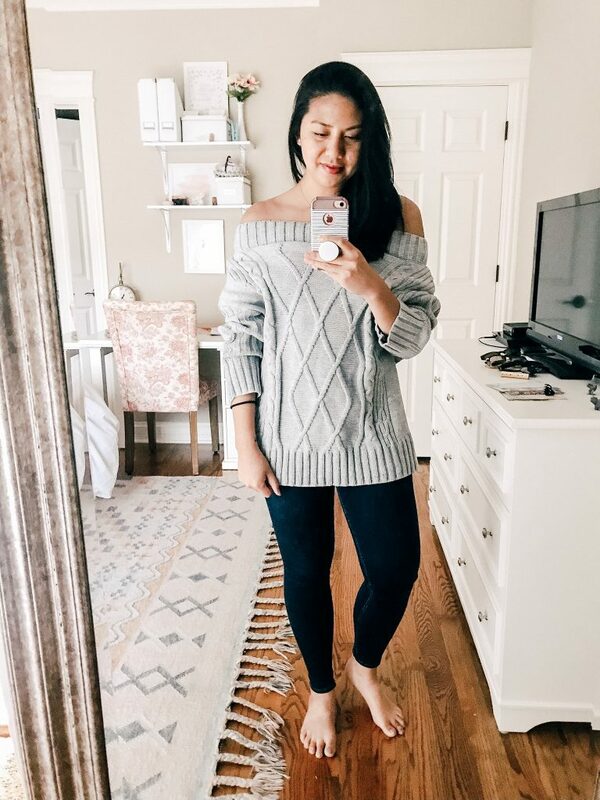 I think the second off the shoulder sweater is my favorite on you! I like the off the shoulder sweaters! Amazon clothing shopping can be difficult but I feel like reading the reviews can difficult. that first sweater is my fav! So so cute! It’s one of my favorite finds! So many cute sweaters! Amazon has been killing it lately in the fashion department. Thanks Samantha! They really have! I like the balloon sleeved one but I’m so shocked that theres only one size! You got lucky that it was the right one for you! Yea, I never understood why there’s a one size fit all. I was fortunate it fit! Okay love this!! 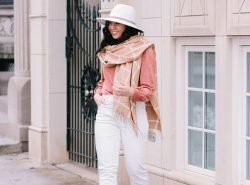 I’ve been eyeing a few pieces from Amazon but have been hesitant because I just didn’t know if it was going to be worth it or good quality but your roundup makes me more confident to try. The yellow sweater and the packable jacket are by far my favorite!! I would love to see you do a post like this in the spring rounding up your favorites!! Thank you so much Linda! 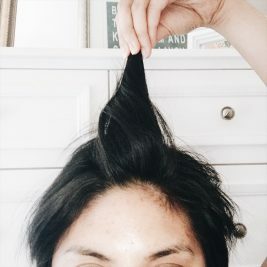 OMG girl, I can’t wait to showcase what I found for Spring! I don’t like prime because it can be inconsistent. However, I love each pick. You look lovely in all of them. I know the inconsistent is annoying. Thanks Maria! I love your picks dear, especially the 2nd one. Amazon really has some amazing products. I love all of theses affordable sweaters. If I should pick a favorite the classic buttoned one may be my favorite ! Beautiful finds from Amazon! I used to shop there too for the snow outfits. I like the yellow knit the most. Amazon is seriously becoming my go to for anything fashion related! They have SO much stuff, it’s almost overwhelming! Love the balloon sleeves the most! Same! You’ve been finding really good dresses Jen!